The Dental Assisting program at Ivy Tech is the only one in the State of Indiana where graduates can earn five workforce certifications and one license, and become immediately employable when they graduate. The cost of earning a Dental Hygiene degree at Ivy Tech is less than half the cost of earning a Dental Hygiene degree at a four-year college or university! Sonography is a growing and rapidly changing field. Get the training you need for your career in our cutting edge laboratory! If you are interested in healthcare and providing quality care without direct patient care, Health Information Technology is the field for you! Healthcare Specialist is the perfect place to begin your health care career. The short certificates make you employable in a year and you can work while continuing towards your AAS. Possible degree and credential options, full list here. Kinesiology and Exercise Science will provide an understanding of the human body and its motion to prepare students to be anything from a fitness instructor or coach, to working in sports management and marketing. Our students get to participate in simulation labs acting as a member of a healthcare team to prepare for the real-world as a Medical Assistant! Our students have an excellent pass rate on the national board exam, our programs are accredited, and we have great clinical support from community healthcare providers. This program is excellent for “budding scientists” and builds quality skills for anyone wanting to work in hospital, reference, or research laboratories. This program gives you the opportunity to acquire the knowledge and skills necessary to work in optical sciences. Through access to state-of-the-art lab equipment, optical clinics and dispensaries you will be provided with substantial real-world experience. During your time in the program, you will be eligible to take the national certification exams offered through the American Board of Opticianry (ABO) and the National Contact Lens Examiners (NCLE). This program offers lots of scenario-based critical thinking exercises, labs with high fidelity manikins, hands-on patient assessments, and even a cadaver lab so students can practice advanced life support skills that would otherwise be only lectured about in class. Do you want the opportunity to obtain a job working closely with patients to ensure their daily needs are met? The Patient Care Technician program prepares you for a job in a variety of settings with skills such as taking vital signs, performing electrocardiography, drawing blood, and other procedures to assist with critical day-to-day care some patients require. Our Physical Therapist Assistant program prepares individuals, under the supervision of a physical therapist, to implement physical therapy treatment care plans, train patients, conduct treatment interventions, use equipment, and observe and record patient progress. Includes instruction in applied anatomy and physiology, applied kinesiology, principles and procedures of physical therapy, basic neurology and orthopedics, physical therapy modalities, documentation skills, psychosocial aspects of health care, wound and injury care, electrotherapy, working with orthoses and prostheses, and personal and professional ethics. The Licensed Practical Nurse (LPN) is an integral part of the health care team. PN graduates are qualified to provide basic care, under the direction of registered nurses and doctors, for patients in a variety of health care settings such as nursing homes, extended care facilities, hospitals, clinics, home health care and physician offices. Per the Bureau of Labor Statistics, employment of licensed practical nurses “is projected to grow 16 percent from 2014 to 2024, much faster than the average for all occupations". Ivy Tech offers the only associate degree radiation therapy program in the state of Indiana and our VERT program is one of just 11 such programs in the United States. 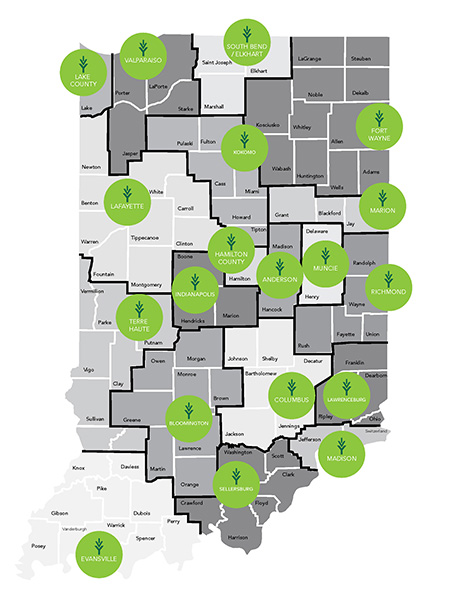 Ivy Tech campuses around the state offer nine of the total 11 Respiratory Therapy programs in Indiana. A career in Surgical Technology is very fast-paced and challenging. You may be able to hold a beating heart in your hand or be part of a team in the Operating Room working on replacing a total hip or knee in the orthopedic rotation at your site! Our program offers smaller size classes that allow for one-on-one personal instruction during class. Students also receive additional training apart from the 500 hour minimum requirement by the state. Adv. Autom. & Robotics Tech. Advanced Automation and Robotics is designed for students interested in great careers in a global marketplace with world-class companies. There is a huge shortage of skilled employees in manufacturing, and this degree will provide you with the skills needed to be successful in the modern manufacturing environment. Agriculture is one of the largest sectors of Indiana’s economy with a $20 billion annual impact, and as this sector becomes more high-tech, the need for trained college graduates in agriculture is increasing. The Automotive program, with the support of industry partners, is designed to be interactive and relevant to current and future industry demands. The program incorporates industry recognized certifications as well as highly qualified instructors that believe in quality student learning experiences. Ivy Tech's Aviation Maintenance Technology program is certified by the Federal Aviation Administration (FAA) to teach students the skills needed to perform maintenance, inspection and repair of civilian aircraft. The Aviation Management program is a great way to get started in the field of aviation! The Aviation Technology program is a great way to take your future to new heights! Through Ivy Tech’s Aviation Technology program you will receive hands-on, real-world training in Professional Flight Education – allowing you to pursue the career of your dreams. The job outlook for building construction management is growing at a 16% rate, faster than the average growth rate. * All construction jobs, big or small, need to be managed and our Building Construction Management program will prepare our students for those duties. By 2018, construction and manufacturing fields will have nearly eight million job openings, and 20 percent of the country’s construction workforce will retire in the next two to four years. Graduates get to solve chemical mysteries in almost every sector of business, and are prepared with strong trouble-shooting, communication, and analytical skills that make them highly desirable in many sectors, even those beyond the chemical laboratory. Items that we use every day have been created by people with design technology backgrounds. Before something is put into production it must be designed. There are a variety of industries in which students can work including, architectural firms, construction companies, machining companies, and more. If you have an interest in a hands-on program that will help you diagnose and repair high-tech systems, this program is for you. Ivy Tech graduates are sought after by local employers for a variety of positions in the field. Electrical engineering and electronics technology are fast-changing fields vital to almost every facet of modern life, and many employees and entrepreneurs are needed every year to meet demands. If you like math, science, and technology, EET may be the choice for you. With the EET-AS degree, you can get a high-paying job, and continue to work on a Bachelor’s degree at IUPUI or another university. Electronics and computer technologies (ECT) are fast-changing fields vital to almost every facet of modern life. Many employees are needed every year to meet demands. If you like math, science, and technology, ECT may be the choice for you. With the ECT-AAS degree or Technical Certificate, you can get a high-paying job in installation, service, repair, development and/or maintenance of high-tech equipment and systems. The Energy Technology program is the future! Job growth in the Energy industry is expected to increase dramatically, and we have a 100% placement rate! This program is flexible! The Engineering Technology program is designed to be a transfer program, however as engineering firms work to find new ways to reduce cost and increase productivity, the demand for Engineering Technicians is increasing. HVAC is a part of our lives, so much so that 68% of all energy use is HVAC related. Highly trained HVAC technicians are in high demand in diverse fields including commercial, industrial, residential, hospitals and now even energy related fields such as geo thermal and solar thermal. If you like to work with your hands and interact with machines, then this is the program for you. With lecture time limited to 20% or less, students gain valuable knowledge to prepare themselves for a rewarding career. Hundreds of jobs in the Machine Tool Technology field are unfilled because of the lack of skilled workers. Our program was developed by employers to give students the best chance of landing their dream job. Manufacturing is a great industry that offers great benefits and high-paying jobs, with workers earning about 20% more than in other industry sectors. A society is only as strong as what it makes. If you like to make the future by working with your hands, but also want to apply your math and communication skills to a challenging and rewarding career field, Mechanical Engineering Technology may be the choice for you. Precision Agriculture Equipment Technology is a continually expanding industry due to the technological advances in the equipment used in farming. Graduates of this program are in high demand due to this rapid growth. The career field of computer science has consistently ranked toward the top in job satisfaction and salary over the last 20 years. Ivy Tech is certified by the NSA as a Center of Academic Excellence in cybersecurity education for two year colleges. We are also one of the few two year colleges that offer this program. Many different types of database systems are used by virtually every kind of organization, resulting in a growing number of employment opportunities as a database manager. Informatics thinks big picture, building strong technical skills as well as understanding how we use technology to communicate and solve interdisciplinary problems facing society. This program is loaded with field certifications and lots of internship opportunities with active partners in order to help you better yourself for the future! students learn the skills necessary for immediate employment in a variety of positions throughout information technology. The field of Server Administration is expanding quickly and so has the demand for people with this degree. For those that are tech savvy, this is a program that will help you reach your potential. The demand for individuals that have a degree in Software Development continues to grow just as the available technology does. This is a program that will have many options upon graduation, including advancement in a current job. Visual Communications offers an arena with a variety of creative and technical career opportunities. Students who are set to become professionals in visual communications have the skills that will give them control over their futures. Accounting jobs pay very well and are in-demand. When you graduate you will be able to go right into the workforce or transfer to a four-year institution. The Business Administration program at Ivy Tech puts students directly in real-life scenarios and actual business situations and simulations to ensure students gain valuable job skills through a quality education. Business Ops., Apps. and Tech. As an Office Administrator you can be working in a career named one of the top Hoosier Hot 50 jobs, leading to a great future for you. We are one of the few colleges in the state to offer this comprehensive program, and as a graduate you will be in high demand with our certifications. If you want to start a business, or run yours more effectively, the Entrepreneurship program will help you avoid costly mistakes. The sky is the limit with Entrepreneurship at Ivy Tech! Supply Chain and Logistics are two of the biggest industries in the state of Indiana. Indiana’s central location along with access to global markets is attracting an increasing number of companies to our state. The Criminal Justice program gives students the opportunity to work with professionals in the fields including SWAT teams and other tactical teams through our Emergency Response Training Labs. The Early Childhood Education program focuses on early child growth and development including adult-child relationships. Emphasis is placed on the development of skills and techniques for providing appropriate environments and care for young children. Our Environmental Design students typically have jobs at the time of graduation, and are well connected to their professional and local community. Careers in emergency preparedness and response and environmental health and safety are in demand and are an important part to the well-being of our community. While our program remains 1/4 the cost of other Culinary Schools in the region, we offer the same hands on learning and are nationally accredited by the American Culinary Federation Accrediting Commission. Students learn how to listen, interview and provide feedback, and are prepared to further their education as future social workers and counselors! Students who are interested in the law in any capacity would benefit from the Paralegal Studies program. You will learn the substantive nature of the law, as well as how to transfer that knowledge into the skills needed to be successful in the legal profession. Are you the type who likes to help people and has a curiosity that thrives on helping them find the answers to questions or takes an interest in new media, technology or the internet? Then our Library Technical Assistant program might be for you. Funeral service is a human services profession. As a professional in the field, you will aid families in coordinating meaningful services related to their loss. Use the Indiana College Costs Estimator to compare tuition at Ivy Tech Community College against that of Indiana’s other colleges & universities to determine available aid. *This campus may not offer this program. Please visit a program page for more information. Disclaimer: Wage data taken from U.S. Department of Labor, Bureau of Labor Statistics. May 2017 State Occupational Employment and Wage Estimates: Indiana. (2018). Admission, Registration and other assistance available through part-time site coordinator. Select a campus or site from the menu above to see location and direction information.